Image: “Ruminations on Labour”. 9 May – 31 July 2018, Experimenter, Kolkata. Invite. Image courtesy and Experimenter, Kolkata. “Ruminations on Labour brings together 3 individual artists and a collective and showcases works across various media, including sculpture, installation and painting. 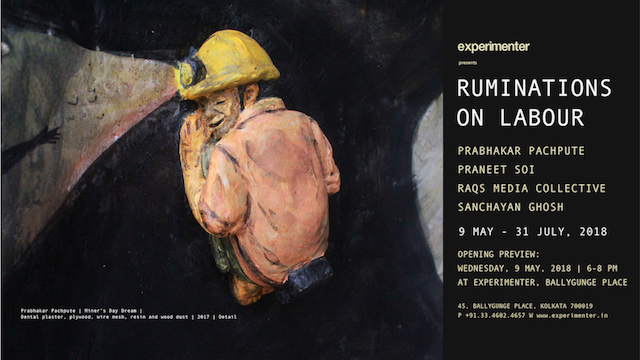 The show is on display at Experimenter’s new gallery space at Ballygunge in Kolkata, which was inaugurated earlier this year. Art Radar spoke to the artists in a panel discussion to shed more light on their group exhibition and their intentions. Read more here on Art Radar Journal. Sanchayan Ghosh, ‘Cross Exam My Nocturn Doubts – ‘Labour Reconciled’’ (installation view), 2018, brick dust, lime, jaggery and khoyer mortar slabs, LED Text on board, sound, books and journals. Image courtesy the artist and Experimenter, Kolkata. Prabhakar Pachpute, ‘Collective Memories’ (detail), 2017, plaster and paint, dimensions variable, suite of 5. Image courtesy the artist and Experimenter, Kolkata. RAQS Media Collective, ‘An Afternoon Unregistered on the Richter Scale’, 2011, video projection of treated and animated archival photograph, 3-minute loop. Image courtesy the artist and Experimenter, Kolkata. Prabhakar Pachpute, ‘Miners Day Dream’, 2017, dental plaster, plywood, wire mesh and resin and wood dust, 36 in x 48 in x 48 in. Image courtesy the artist and Experimenter, Kolkata. Praneet Soi, ‘Kumartuli Printer – Notes on Labour’ (carousel projector detail), 2010, 80 slides, rotary carousel projector and drawings. Image courtesy the artist and Experimenter, Kolkata. Sanchayan Ghosh, ‘Cross Exam My Nocturn Doubts – ‘Labour Reconciled’'(installation view), 2018, brick dust, lime, jaggery and khoyer mortar slabs, LED Text on board, sound, books and journals. Image courtesy the artist and Experimenter, Kolkata. Prabhakar Pachpute, ‘The Wide Divergence of the Cotton Gin’ (installation view), 2017, charcoal and acrylic on canvas, 96 in x 156 in. Image courtesy the artist and Experimenter, Kolkata.